With the recently proposed Energy East pipeline joining other proposed pipelines across the country, our local watersheds and land are under direct threat. If these pipelines were built, they would make it impossible for Canada to do its fair share to stop climate change. We have a real opportunity to change that. As millions of people in the United States stand together against the Keystone XL pipeline, it’s our job here to stand for a different energy future. Globally, there is now more investment in renewable energy than all fossil fuels combined. We could be behind a needed transition to renewable energy here in Canada that would help ensure a safe climate for future generations. But we need to make a stand. We cannot allow for reckless tar sands expansion, or the construction of pipelines like Energy East that would facilitate that expansion. 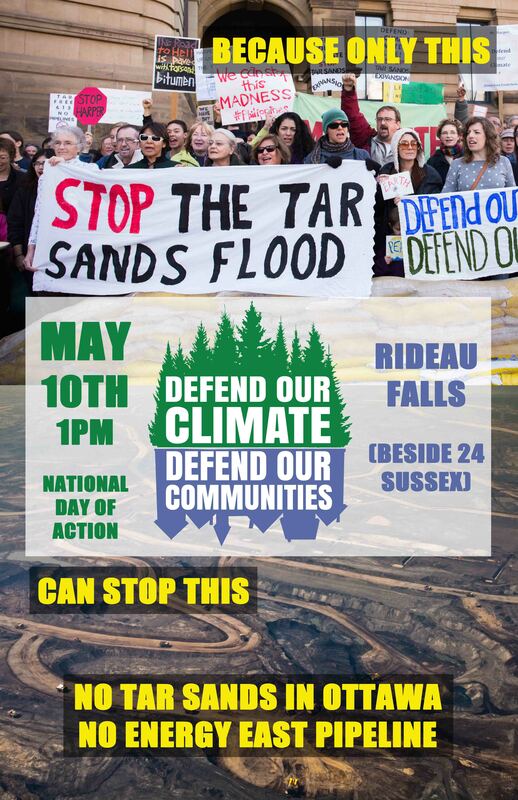 We’re asking you to join us – and 60 other communities – who are uniting their voices on May 10th, to say no to tar sands expansion, no to the proposed energy east pipeline, and yes to a safe climate future and renewable energy. The event will take place at the Rideau Falls (Map), where the Rideau River meets the Ottawa River, which could be impacted by a spill from the Energy East pipeline where it crosses the Rideau River. We’ll have a mock-up of the Energy East pipeline that we’ll work together to dismantle! There will also be some music and a few short statements. If you can, please bring a visual symbol of the bright future you want to see – a drop of water, a tree, a polar bear – please see this guide for creating amazing visuals. You can see the Facebook event here. For more information on the national day of action, see www.defendourclimate.ca. This event is jointly organized by Ecology Ottawa, the Council of Canadians, Idle No More, 350.org Ottawa, and the Greenpeace Ottawa Chapter. Is anyone from Carleton Place going who might be able to carpool?